Google Ads can be a great way to increase traffic to your website and generate leads and sales. If you’ve set up your own campaigns, or you’re not sure if your agency is getting you the best return, here are some things that you can check. Google is currently rolling out a new version of the Google AdWords experience to all AdWords users. Read on to find out how to download an Australian Tax Invoice for GST using the new interface. Google AdWords Glossary – Find out what those terms mean! 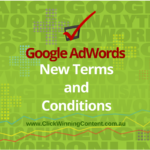 Review a list of terms that are regularly used in relation to Google AdWords campaign performance, and an explanation of what they mean. How can you tell if your competitors are clicking on your AdWords ads? By working with Click-Winning Content to manage their campaigns, Caribu Horse Wear’s AdWords revenue grew by 90.8% from 2014 to 2016 and their average cost per click for Search campaigns decreased by 31.9%. 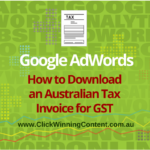 Since 1 November 2016 AdWords ad spend payments have been invoiced by Google Australia & GST has been added. Read on to find out how to download an Australian Tax Invoice for GST.